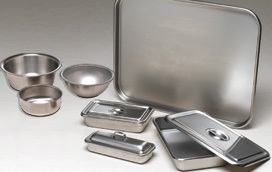 All are constructed of heavy gauge, high-quality stainless steel. Designed for durability and long life. Ideal for cavity fluid treatment of autopsied viscera and in conjunction with viscera bags. 1/ea. Oblong Instrument Drying & Storage Tray. Stainless steel shallow tray with rolled bead edges. Ideal for drying instruments after cleaning and for neatly storing them between procedures. Instrument Tray with Flat Lid. Ideal for cleaning, sterilizing and storing. Recessed strap handles facilitate easy stacking to maximize counter and storage space. 1/set. Instrument Tray with Domed Lid. Stainless steel. Ideal for cleaning, sterilizing and storing. Domed lids with strap handles facilitate maximum internal space. 1/set. Stainless steel. Constructed for long life & durability. Flat bottom. 1/ea. Stainless steel. Handy for mixing and applying cleaners and disinfectants. Stainless steel. Friction-fit flat lids and recessed handles. Stackable. 1/ea. Stainless Steel Graduated Measure Beaker. Features handy pouring handles and spouts. Graduated in ounces and cubic centimeters (cc) for accurate measurements. 1/ea. Liquids and solids flow smoothly through vented stems.